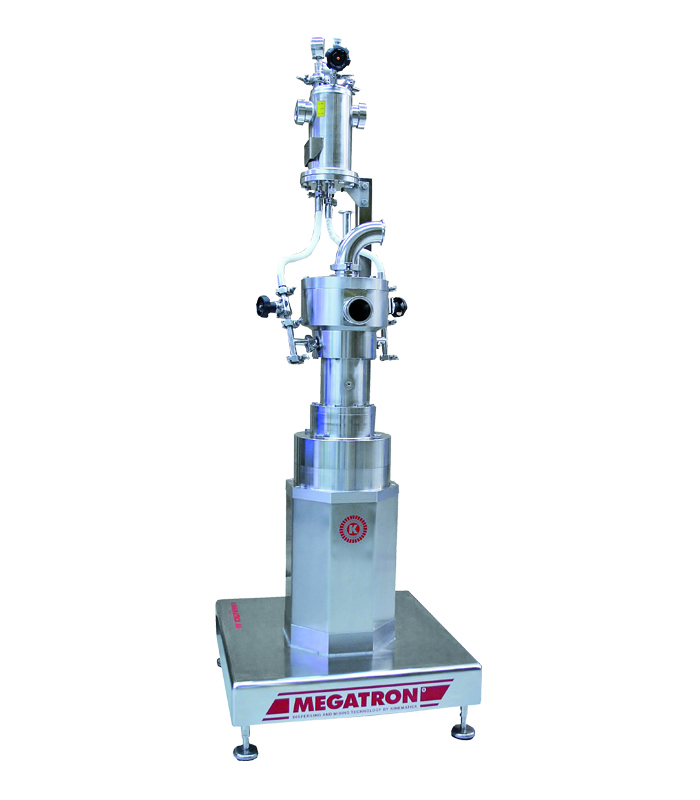 The highly specialized MEGATRON® MT-SV for use in clean room production processes is the result of more than 60 years of experience in dispersion technology and Kinematica’s close cooperation with customers in the pharmaceutical industry. The vertically arranged rotor/stator (dispersing generator) is located in a working chamber in a certified 3A design free of dead spaces. Up to three generator stages in sequence (such as coarse, medium, ultra-fine) can be integrated to ensure the highest shear rates and peripheral speed . The 3A design and low levels of surface flaws ensure that all components that come into contact with the product such as the processing chamber, rotor/stator, etc. can be comprehensively and hygienically cleaned via CIP/SIP. This series has been fully developed for use in clean rooms with guaranteed ease of handling and reproducible results at the highest levels of hygiene. Foreign particles are excluded by the fully-encapsulated water-cooled drive. One to three serially arranged dispersing generators in a chamber ensure a smooth dispersing process. Full cleaning of all components is achieved through CIP/SIP. Flexibility has been built on the level of integration of machine control into the current system. Turnkey systems with the throughput volume of 1,000 to 25,000 lit/hr are also offered to meet unique requirements. Selected Pharmaceutical applications include- infusion solutions, ointments and creams, vaccines, medications, eye drops, wet milling of APIs etc , sterile production in cleanroom environments.